Same Day Delivery for Crestwood School Prom Arrives in Style! At AFS, we are often asked to deliver some quite unusual freight, but last week’s same day consignment was really quite special! 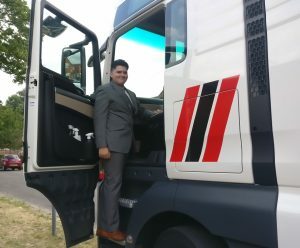 Thomas Bundy, younger brother of one of our drivers Michael, contacted AFS and asked if we would consider helping him arrive in style at his end of year prom. How could we refuse? And so, T66 AFS got to go to the ball, with Michael behind the wheel proudly driving Thomas to Crestwood Community School’s Prom at the Ageas Bowl Hilton! We hope it was an evening to remember for Thomas and his school friends, and who knows, perhaps he will follow in his older brother’s footsteps with a career at AFS?! A.F.S. Haulage, registered as a limited company in England and Wales under company number: 03232328. Registered Company Address: Clarendon Court, Over Wallop, Stockbridge, Hampshire, SO20 8HU.